Would you trust us with an elephant for a day? Pat from Patara Elephant Farm did and it was the highlight of our trip. We took good care of our elephants, rode them, and swam with them. K even won the top owner award for our group. Her prize? A kiss from her elephant. At first we were a little bit concerned about riding the elephants. We didn’t want to contribute to poorly treated elephants for the sake of tourism. Our fears were quickly laid to rest when we saw Pat’s passion in caring for the animals. He explained that elephants have been domesticated in Thailand for over 800 years so riding elephants is nothing new and doesn’t harm them anymore than riding a horse. It is all about how the elephants are cared for and his farm takes good care of them just as a traditional Thai family would — only he has 26. Pat pointed out that elephants need exercise. One of the top causes of death for elephants is eating too much and doing nothing — I said that sounds like one of the top causes of death for humans as well. Even when the tourists are not there they take the elephants for a hike to keep them healthy their nails filed from the sand and rocks. We learned a lot about elephants and how important they are to the Thai people. They are endangered and the population has been dropping fast. 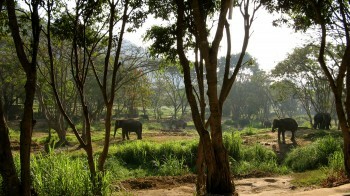 Thailand has a number conservation projects to preserve and expand the population. Patara Elephant Farm has piloted a program to introduce young elephants to the wild and it has been quite successful. You can draw many parallels with Thailand’s elephants to how horses are used in other cultures. Today many Elephants have been replaced by cars and machinery but some are still used and they are all registered with the government, but not as a part of a conservation program. They are registered with the department of transportation! Elephants have full rights to use the public roads in Thailand. They don’t issue license plates for elephants though, only microchips. In some ways, caring for the elephant was good practice for our baby. 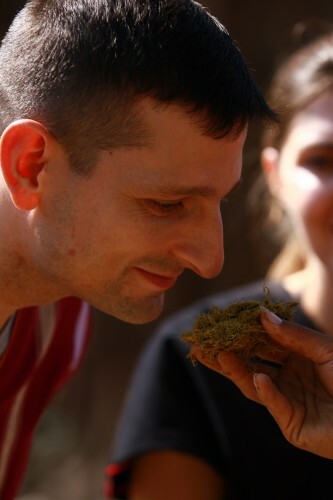 We had to feed it, bathe it, and perform health checks – like inspecting its dung. I understand we’ll be doing the same with diapers in a few months. Though we got to ride the elephants which we aren’t planning to do with baby. We were matched up with two elephants. I cared for the big, calm and mellow mother May Bon Di. K cared for a small, spirited and young elephant Champu. With the smaller elephant, she didn’t have to strain to reach the top. Then we switched for the ride as Champu was a bit ornery and May Bon Di was calm and stable. We also met Qwan, who was 23 months pregnant. As elephants are pregnant for 19 to 24 months, Qwan was ready to give birth any day. Touching her side we could feel the baby elephant kick inside. It made us glad we only have to wait 9 months (an not giving birth to an elephant). Breeding is a big part of the farm’s operation and they focus on doing it naturally. They have four male elephants that they send of on a ‘honeymoon’ with a female elephant when the time is right. They spend 10 days in a romantic forested location away from the other elephants and tourists. Though we saw one couple that couldn’t wait for their honeymoon and put on a bit of a show for us. signs that the elephant was happy such as flapping ears, bouncing and swaying. Then we called the elephant by name and it answered with a trumpet. If an elephant spreads its ears, look out, it isn’t happy and best avoided. We saw this in Tanzania with mothers protecting their babies. Our elephants were all happy, so we could approach and feed them a basket of fruit to garner more good will. After feeding and health checks, it was bath time. Before getting in the bath we had to brush off all the dirt. With a few commands, the elephant would lie down so we could brush off its back. Then it was off to the river. Using a woven basket, we splashed water on the elephant and brushed it until it was clean. Then, at the coaxing of the staff, the elephants gave us a quick bath. Without a saddle and given its height, mounting an elephant sounds difficult. Fortunately, the elephant is very helpful and we had one of three choices to climb on — the front foot, the trunk and telling the elephant to lie down. I opted for the front foot and K went with the lie down option. After a quick instruction on how to steer we were on our way. We used the commands for forward, stop, back and “don’t do that” to guide our elephant, but they certainly knew the trail better than we did, so I’m not sure how well they listened. K’s elephant was well behaved, but mine was a little fiesty at times. The elephant in front of us was more interested in eating than walking which caused a traffic jam a couple times. We rode our elephants through the woods up and down some pretty steep hills until we came to a waterfall where we stopped for a picnic lunch. The elephants drank from the flowing water while we ate more delicious Thai food. There was so much that we couldn’t finish it all, but luckily the elephants were happy to eat what we couldn’t including our ‘plates’ made of banana leaves. Before heading back, we all went for a quick swim. This was a truly amazing experience and we have tons of great photos and videos. Once we get our gallery posted for this trip, you’ll definitely want to check them out. 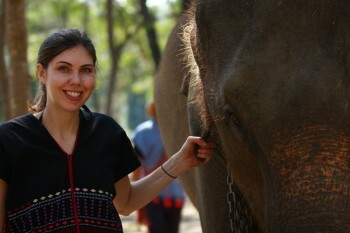 This entry was posted in Adventure Travel, Asia, Thailand and tagged babymoon, Chiang Mai, elephants. Bookmark the permalink. What a fantastic adventure. I like the parallels of taking care of an elephant to taking care of a baby. Aren’t you glad that your baby is only 5-6 pounds with only small kicks? This is truly something to remember.